Sometimes it is well worth the time to slow down on the bike. As I left my office by bike today I noticed a cyclist in the distance with panniers. This is not uncommon around my office – I often see groups of people riding through (always south) loaded down with gear. I knew I would catch up to him/her and figured I’d slow down, say hi, and chat for a bit. So I asked him where he was from, expecting to hear Canada. I was wrong. He was from the Netherlands. Okay, now I needed to know more! Where was he coming from? Again, assuming Canada was the correct answer, which it was, but there was more. 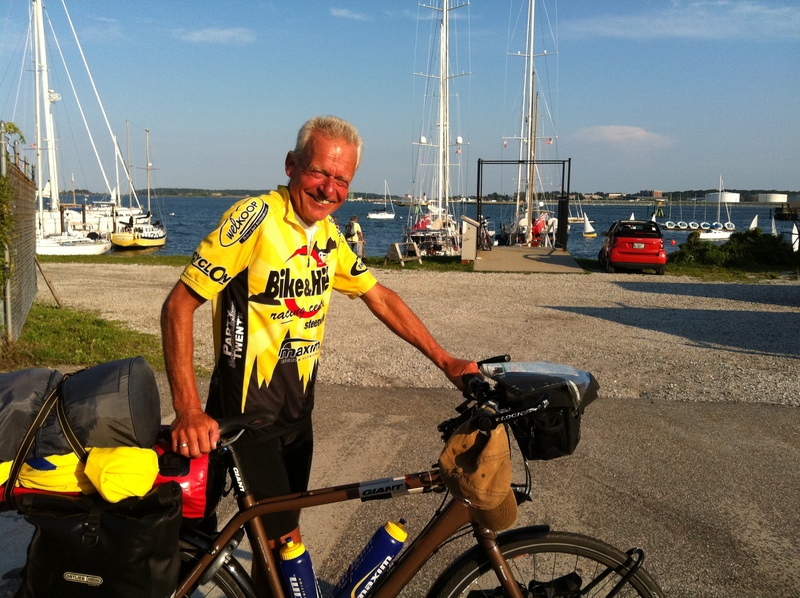 Turns out he had flown to England on June 21st to bike up to Scotland before flying to Iceland and biking around that country then finally flying into Hallifax, Nova Scotia. He explained he was biking to New York and need to be there by September 1st, which was when his wife was flying there to meet him. He was also making this trip solo. We hit a hill and he said, “Okay, bye-bye.” He was much slower than me on the little hill, and with 50 kilos of gear and on a mountain bike, you would be, too! I slowed and he caught up to me at the top. I told him that I wasn’t leaving him because I was enjoying chatting with him and if he didn’t mind, I’d like to ride with him for a while. He was agreeable to the idea so we rode and chatted more. I asked him what the best part of the trip had been. He told me it was Prince Edward Island. I have heard it’s beautiful there and told him that. Then it occurred to me that he didn’t just land in Hallifax and head south. 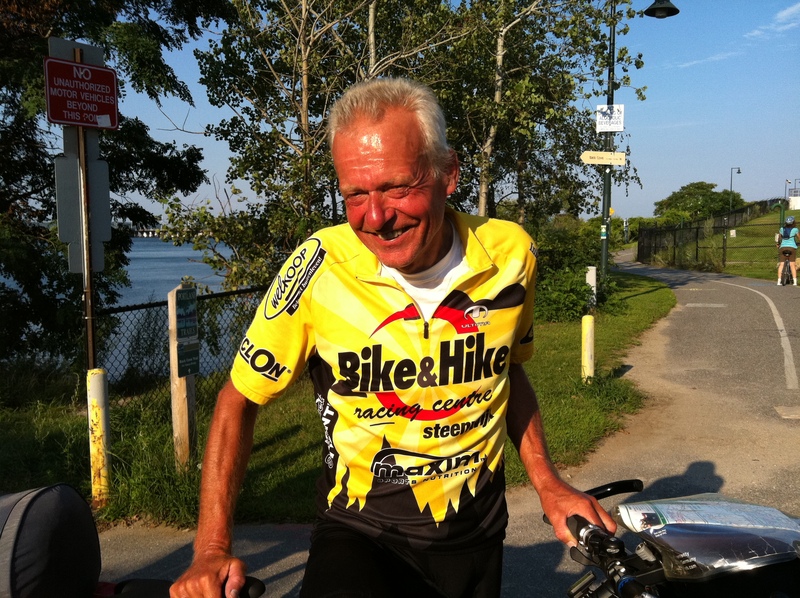 The guy headed north and rode around Nova Scotia before turning towards New York. His average day is between 100 – 120 kilometers (60-75 miles) a day. Every day. He typically stays at a campground and sleeps in a tent but a few days ago, when I rained a lot, he told me with a sly grin that he stayed in a motel instead. Soon I got to the intersection where I would normally turn right. Knowing George was going straight, I decided to go straight and continue to ride with him. We talked about what we did for a living, how many kids we each had (and how many grandchildren he had), etc. I’m not sure what it is about being on a bike but I can talk to anyone when I’m out biking. Put me in a room of strangers and expect me to mingle and I struggle. When I’m on the bike I can roll up to anyone and strike up a conversation. He had ridden all over France and Switzerland in his life. I joked that this route must have seemed pretty flat to him after biking in Europe.This trip had been a dream of his for 10 years and here he was making it happen. As we neared Portland I was already late getting home but decided a detour was in order to show him an efficient way to get him through the city and towards his destination a bit quicker. We got to a point where I was going to leave him and wanted to get his picture. He was happy to accommodate my request. I called my husband to report that I was late, had a good reason for it, and would explain when I arrived home soon. He informed me that he still wasn’t home and would be in about 30 minutes. I made the decision to ride a little further with George to make sure he made his way okay. Then I realized it would be really nice to take a photo of him in Portland and email it to his family. He also thought this would be a great idea. So we did! "Greetings from George in Portland, Maine"
It was finally time to say goodbye to George. I wished him well and told him it was a pleasure to join him on part of his journey. I will be thinking of him often over the next few weeks as he continues on his trip and especially on September 1st when his wife arrives to meet him. Tonight I got home an hour later than normal, took a route I wouldn’t normally take, all because of a man named George. And I was happier for it. I think I mentioned previously that earlier in the spring, when it was cold, rainy and I had other meeting and social commitments, I had spent more time off the bike than on it. Surprisingly, I think that was better for my fitness. I was well rested and my hard efforts were good. I also didn’t feel burnt out by the time July rolled around like years past. Since then the weather became great for cycling, I was commuting to/from work by bike when the weather and my schedule allowed, which was a lot. Not to mention being on the bike for my weekly group rides. However, last week I was on the bike riding home from work before the Wednesday night ride and just knew I didn’t have it in me to keep up with the group. I knew it physically and mentally. Luckily I promised some less experienced girls that I would be on the ride to hang back with them so they would have someone to ride with. It didn’t take long for me, with the two girls behind me, to get dropped. The pace was high and with a gap I couldn’t close I fell behind quickly. When I returned home every part of my legs ached. I realized then that it was time for a rest week. It’s been a while since I’ve had any significant time off the bike and I am way overdue! The only ride I have done during this week was the recovery ride on Monday yesterday. Since today was pretty much the pick of the week I thought a little easy spin to commute to work couldn’t hurt either – keeping my recovery slightly active. The part I dread is getting back on the bike with flat legs and the time it will take to work through that. Still, it should be worth it, both physically and mentally. This is the final installment in this blog series. We saw some kids at the Portland Observatory that were here on vacation and mentioned they were headed to the Gray Wild Animal Park during their stay here. That reminded me that I hadn’t been there since I was a kid and though Dad might like it. 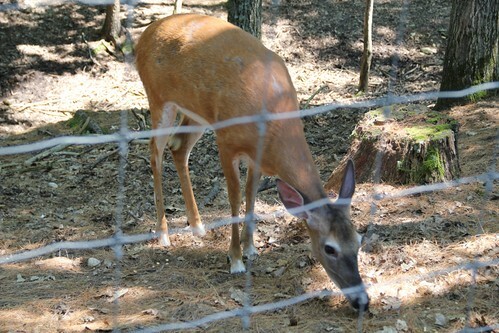 They are a lot of native Maine animals at this park. Unfortunately it was so hot that many of the animals were trying to stay cool in some of the shade, including the moose so we didn’t really get to see them – they were too far away under the cover of some trees. 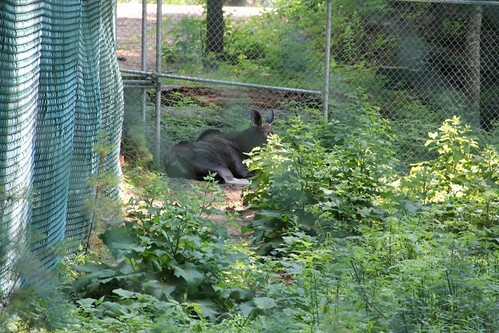 Moose hanging out in the shade very far away from us. 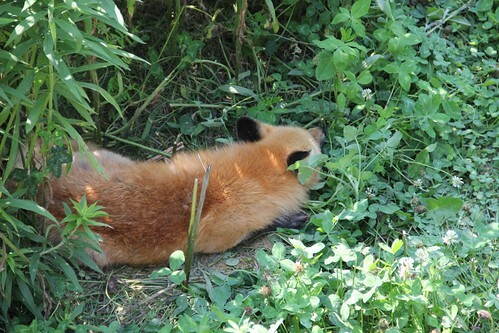 This fox was finding a little shade in the scrub. 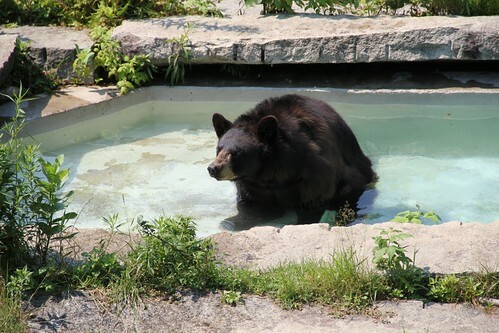 I think the bears had it the best – a pool to cool off in. The deer and the bears knew the routine – people meant food. There was a food dispenser not far away that you could buy to throw to the animals. This guy was enjoying the corn we provided him from a nearby dispenser. 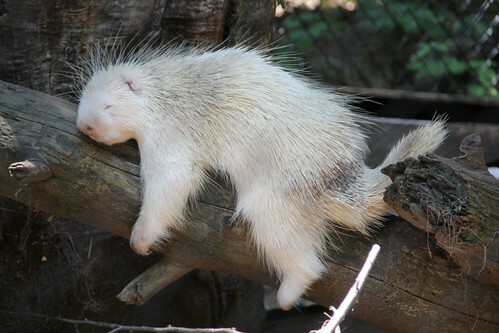 Even the albino porcupine was dealing with the heat in his own way. This was the funniest photo we took all day. 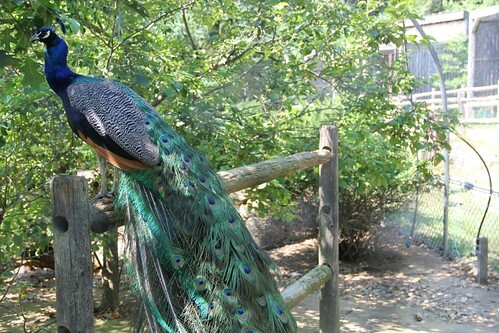 We hoped he was going to spread his feathers but never did. 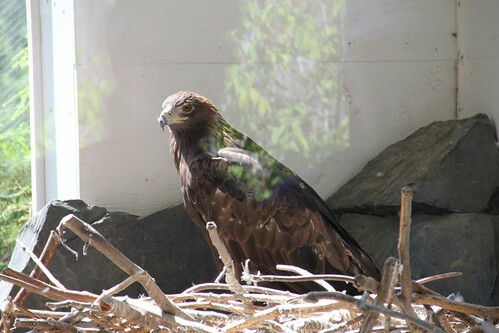 A golden eagle. They are always majestic. There was a bald eagle too, but we were not able to get any photos. 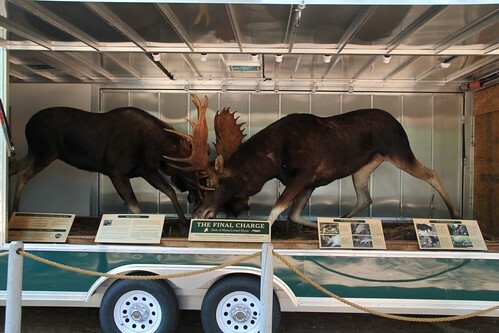 One of the best displays there was this display of two moose that whose remains had been found a while back with their antlers locked. It’s believed that they got locked during rutting season and never came loose and the animals died as a result. It’s been a long time since I’ve been on a whale watching trip. We thought it would be fun to do with my visiting father-in-law. 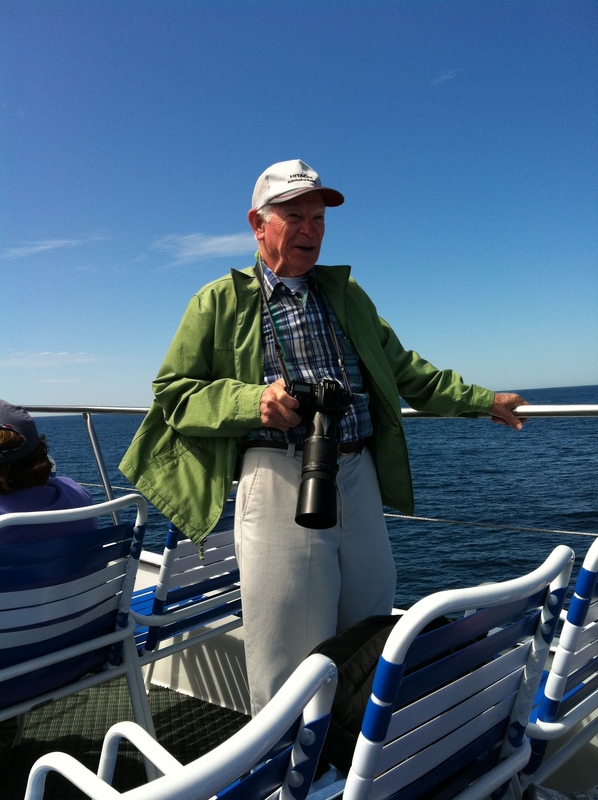 We drove to Boothbay Harbor for an excursion on Captain Fish’s Whale Watching Trips. 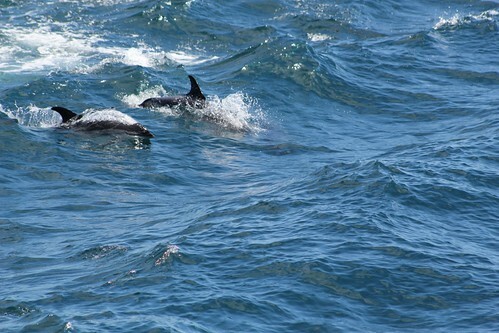 Unfortunately we didn’t see any whales but we did see some dolphins. 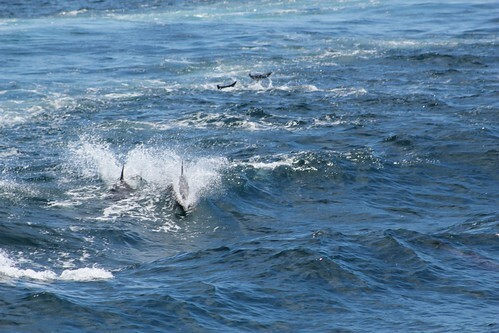 A video of the dolphins – the loved surfing in the wake of the boat. My fitness has returned. Finally! Wednesday night was our mid-level ride and it’s been getting a bit fast. It was my third Wednesday night ride all season and I was a bit nervous. It’s a bit hillier than our other rides and although I didn’t kill it, or myself, on the hills, I didn’t get dropped. There was a wait spot at the top of the climb I typically struggle on so I was able to still continue on with the group. Today was our fastest ride of the week and I managed to hold on the entire way and felt pretty good. This year that fitness has arrived a little late but just in time for the weather to be nice and getting some decent riding in. And most of that riding will take place with some of the best women on bikes – my Portland Velo Club club mates.